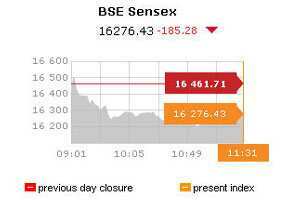 Markets at 11:31 am on 18-11-2011. Shares in largest-listed company Reliance Industries Ltd , and frontline banking and auto stocks led the losses, and even shares of software exporters could not register any gains despite the rupee slumping to a near-32 month low. “Basically there is uncertainty about earnings going forward, input costs staying elevated and fiscal deficit," said K.K. Mital, chief executive for portfolio management services at Globe Capital. “All these headwinds are impacting market confidence and fresh buying is just not taking place," he said. By 10:56am, the main 30-share BSE index was trading 1.51% lower at 16,220.09 points, with 25 of its components trading lower . The index is on track to post its third straight weekly decline. The benchmark is down nearly 20% in 2011 and is among the worst performing markets in the world. Foreign portfolio investors have bought equities worth about $600 million so far this year, sharply down from $29 billion they invested in 2010. Analysts said with several stocks close to their year-lows, promoters were facing pressure on shares pledged with lenders, further weighing down the market. More than $33 billion worth of shares have been pledged with banks as collateral, with founders of as many as 17 companies pledging over 90% of their holdings, Bank of America-Merrill Lynch said in a June report. Energy major Reliance, which has the highest weightage in the index, dropped 2% to ₹ 793.55. The stock has fallen nearly 10% so far in November. Banking shares continued their downward trend on worries that rising slippages and provisioning due to high interest rates would impact earnings in coming quarters. Auto stocks, which have also been under pressure due to a sharply lower demand, also took a beating. Maruti Suzuki fell 3.5% to its lowest level in 2-1/2 years, while Tata Motors and Mahindra & Mahindra fell 4.3% and 2.4% respectively. The rupee fell past 51 per dollar for the first time in nearly 32 months, but did not have a positive impact on software services exporters such as Tata Consultancy Services and Infosys, which get more than half their revenue from the United States. TCS fell 1.9%, Infosys was down 0.4%, while smaller rival Wipro lost 0.8%. Among stocks that bucked the downward trend, largest two-wheeler Hero Motocorp was up 2%, while drugmakers Sun Pharmaceutical and Cipla rose more than 1% each. The 50-share NSE index was down 1.5% at 4,861.60 points. In the broader market, losers outnumbered gainers in the ratio of 6:1 on moderate volume of 224 million shares. Kingfisher Airlines fell nearly 18% on concerns about the cash-strapped carrier’s ability to tie up funds to continue operations. The stock recovered partly, but was still trading down 7% at ₹ 23.35. On Thursday, India’s civil aviation minister ruled out a public bailout for Kingfisher or any other airline, urging private airlines in India to put their own house in order. .
Suzlon Energy fell 8% to a fresh all-time low of ₹ 23.30 a day after the controlling shareholders in the wind turbine maker sold a stake of about 2% for $20 million. JSW Energy fell more than 7% to an all-time low of ₹ 42.35 after the Economic Times reported that regulatory authorities have rejected the company’s plea to revise power tariffs because of difficulty in procuring fuel from Indonesia.